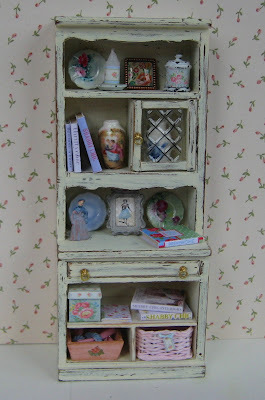 The All New Shabby Chic Hutch Dresser! Here's what the hutch Kim sent me looks like now I've waved my magic wand! You can see what it looked like before in the previous post. The best part is finding things to fill it up with. 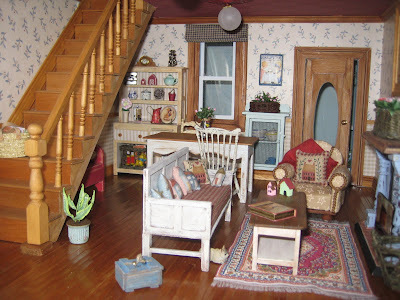 Oh, the hutch isn't crooked, once again it's my photography! Kim also sent me those sweet little floral plates. I had a lot fun filling up the drawer. There's a notebook, scissors, a candle, matches, a photo, a map that someone has put away without folding it up properly (can anyone ever fold a map up properly! ), an oversized pencil, a museum brochure and a leaflet for the local pizzeria. School holidays are here now so the mini making has slowed down a little! To quote Sabiha 'this week it is raining gifts'! 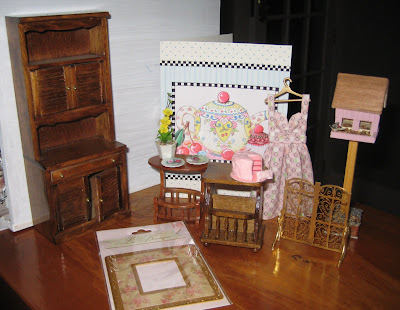 Today I received a package of goodies from Kim Saulter of 'It's a Miniature Life'. 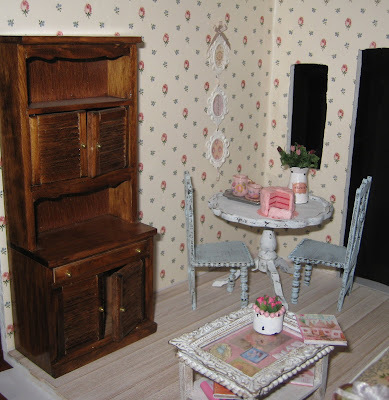 Kim said she would send a hutch dresser for me to 'work my magic on' for the shabby house. But she also sent all those other goodies - lots of wonderful things for me to play with! So much fun to be had! 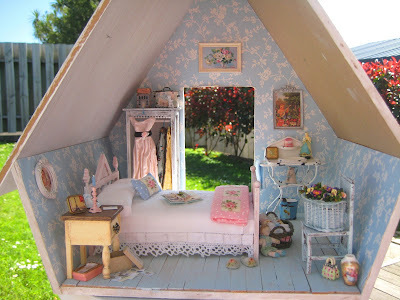 I had been having some trouble finding a dresser that was the right size (and was too lazy to invent one) and look at this one, it is the PERFECT size for this little house. Check back in a day or two to see how it turns out once I've waved my wand, lol! 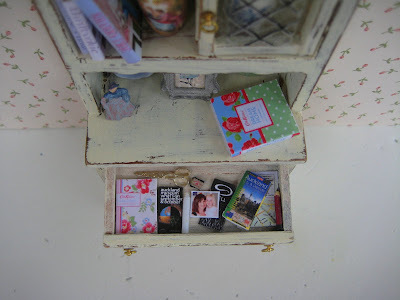 If you haven't already popped over to Kim's blog you are in for the most wonderful treat (Kim is the BEST when it comes to shabby chic)! 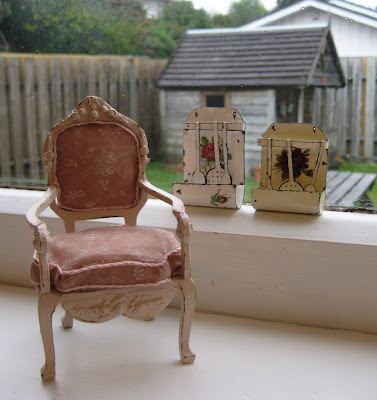 Today I recieved some wonderful mail from dear Sylvia, she made me this absolutely beautiful chair. 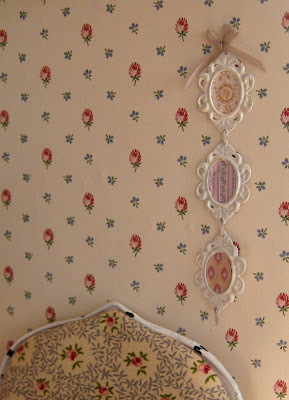 Here it is in the master bedroom, it is just perfect! There's Mr Nylon doing what he does best! 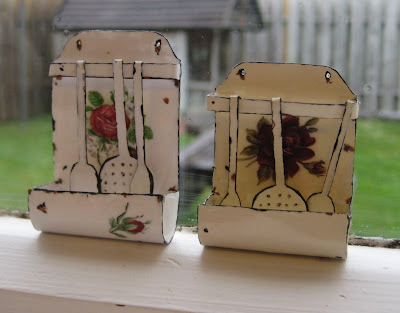 I asked Sylvia to make me one of these gorgeous utensil holders...and she made me two! She has even made the utensils herself, how fantastic is that!! You may have noticed that the dining table has been moved from the kitchen to the lounge, there was always too much unused space in the lounge. 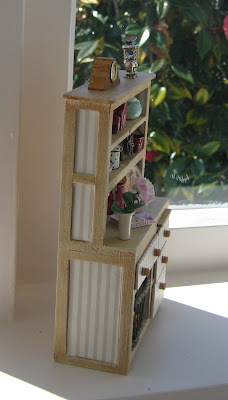 And now the hutch dresser that was in the kitchen is also in the lounge, although it has been given a facelift! Here's how it looked in the kitchen. 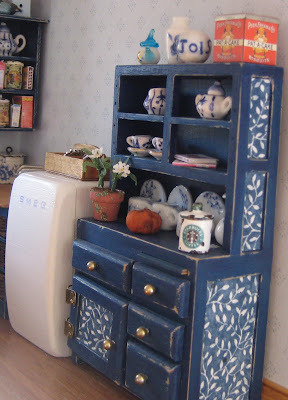 I had painted and papered it to match everything but was never happy with those drawer fronts, they just seemed too chunky. So I've given it some new drawer fronts and covered them with wallpaper. And there's a basket of toys where the cupboard was. 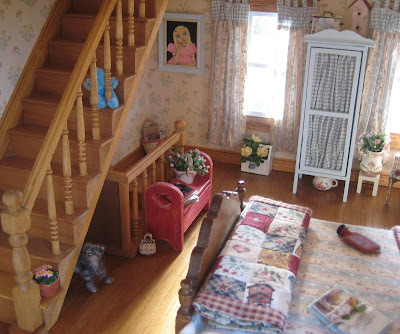 I figure that as the children's rooms are all in the attic Mrs Nylon won't want to be trekking up and downstairs with toys all day...'cos let's face it, it's not like the kids will ever put them away! 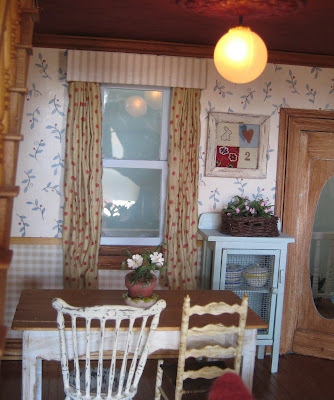 The stripy wallpaper is the exact same colour as the gingham wallpaper in the lounge. 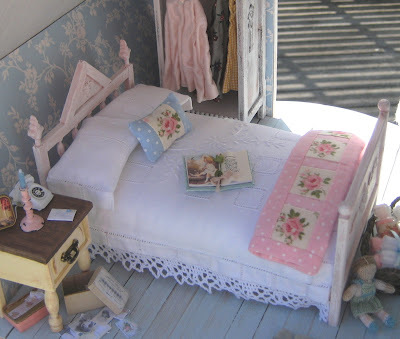 Spent the weekend making some shabby chic bedclothes. 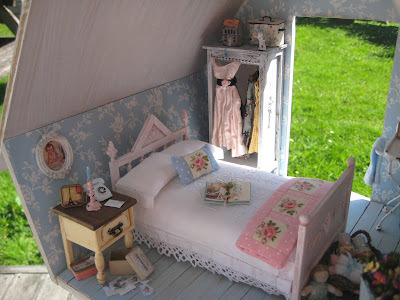 I think I was inspired by Linda's all white bedding but of course I couldn't have everything just white! Took the shabby bedroom outside to take these pics as it's a beautiful spring day here! 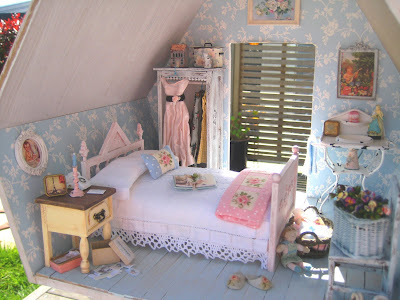 I could happily move into this little room! Now it's time to collect the kids from school, back to the real world I guess! When we last left Mr Nylon he was on his way to the kitchen to look for a cup of coffee. You'll be happy to know he eventually found the door, but alas that's as far as he got. Just look at the destruction in this room. 'AAAarrrrggggghhhh! ', thinks Bri, 'a man could die of thirst around here'. 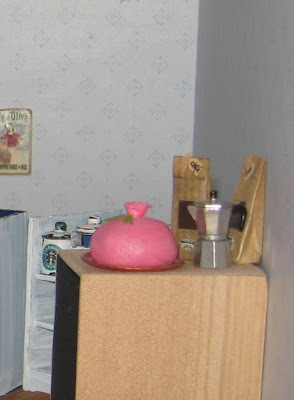 Being a man, Mr Nylon is not all that familiar with this room however he can see the coffee pot and coffee (so beautifully packaged by Sabiha) sitting tantalisingly on top of what looks to be the beginnings of a new stove. So even if he knew how to make the coffee he wouldn't be able to do it (that's usually his long suffering wife Silky Nylon's job). 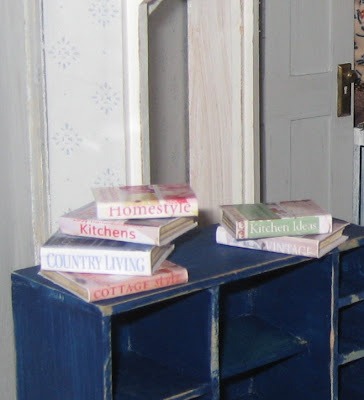 Judging by the stack of decorating books there it looks like the decorator has big plans for this room...hopefully she knows what she's doing. Mr Nylon's main concern is how he will ever be able to afford a new shirt with all these seemingly unnecessary renovations going on. 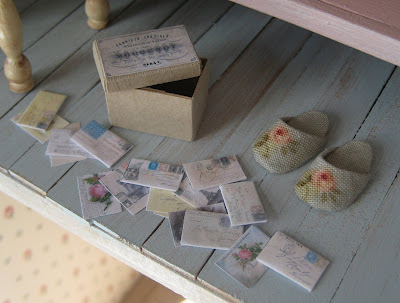 Shabby mini mail from Linda! 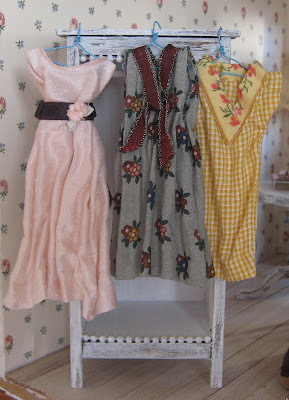 Just take a look at what arrived in the mail from Linda at Une Petite Folie today! These have to be the world's tiniest letters! They're each about 1cm long and they came in that gorgeous little box there. 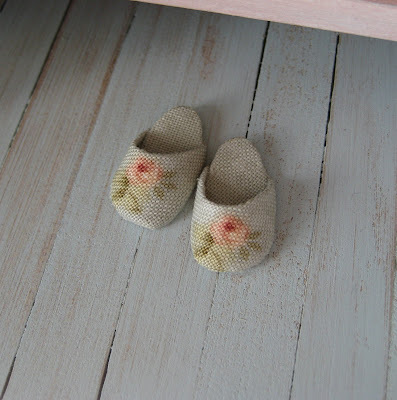 Linda also made these perfectly shabby slippers, how sweet are they?! 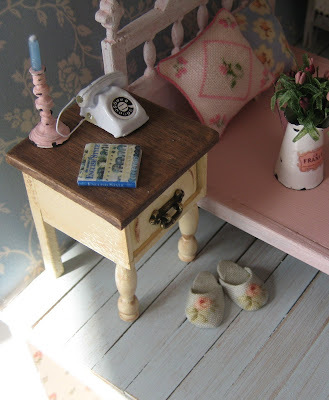 Whoever lives in this little house with those shabby, cold floorboards will be very happy to have such a beautiful pair of cosy slippers by her bed! 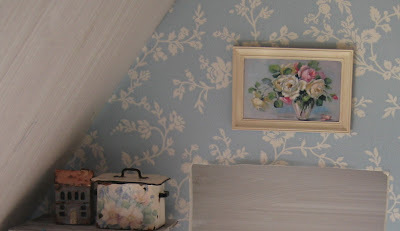 Linda also sent me this beautiful rose picture it has the perfect colours for this room. And another beautiful picture, this one of a building in Provence. 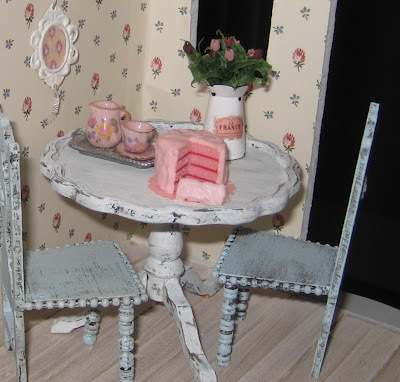 Linda's miniatures are absolutely exquisite, it's quite surreal to have them here in my own home after seeing her work on her blog for so long! 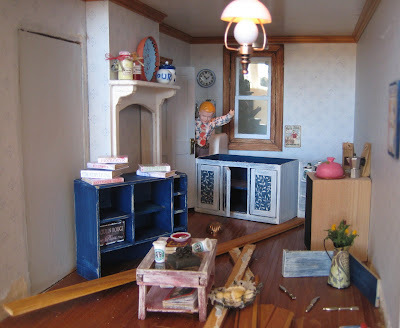 Pop over to Linda's blog and daydream in her little French world! 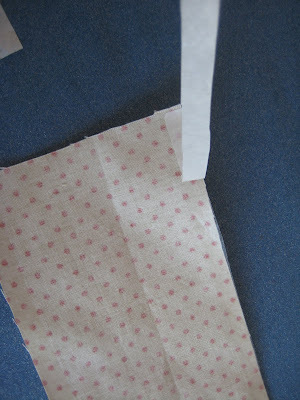 I've had a few enquiries about how I get fabric to drape and stay that way, so I'll show you how I do it. 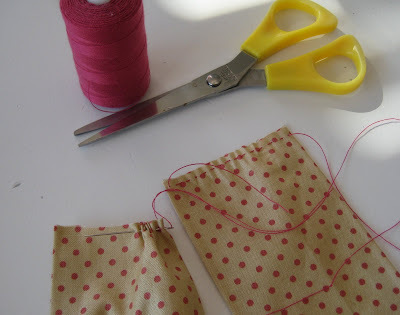 I'm about to make some curtains but you can use this method for pretty much anything made from fabric that you want to drape nicely and stay that way. 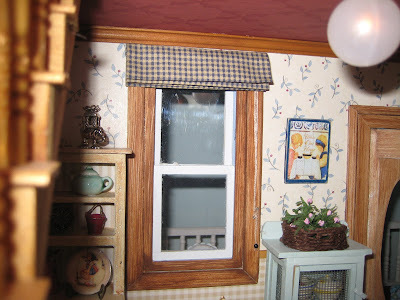 My dollhouse windows are the standard size. I have used about 9cm of fabric for each curtain because I want them to end up quite narrow and not take up too much space. 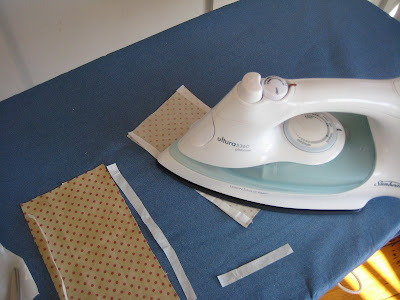 I use HeatnBond to make all the hems. This way there is no stitching showing and the edges won't fray. 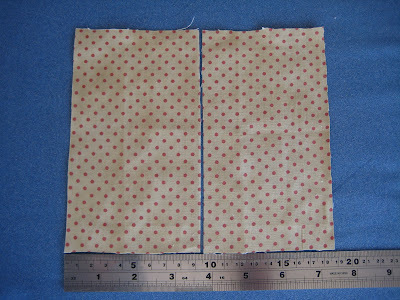 You can also use fusible webbing or hemming tape. These are the strips of HeatnBond. 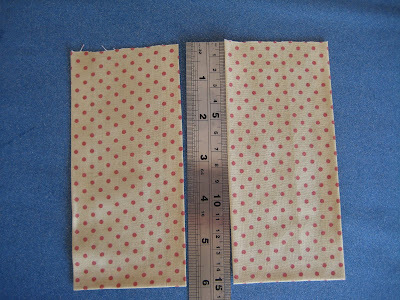 I've cut them about half a centimetre wide. 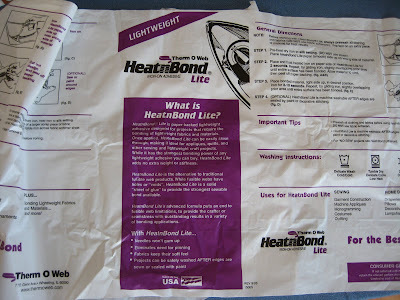 Apply the HeatnBond according to the instructions on the packaging, it's VERY simple! Peel the paper off the HeatnBond. 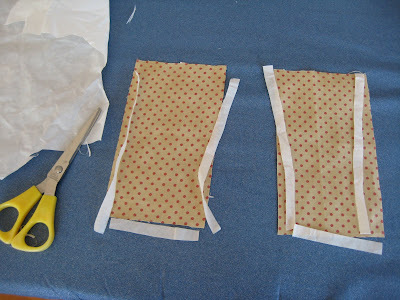 Fold over all the hems and iron flat. 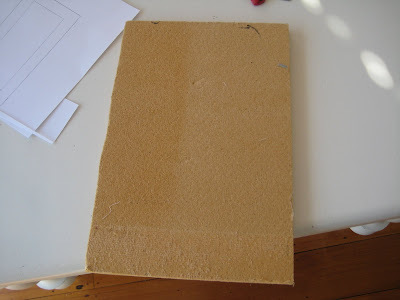 You'll need a piece of softboard or something solid you can easily stick pins into. 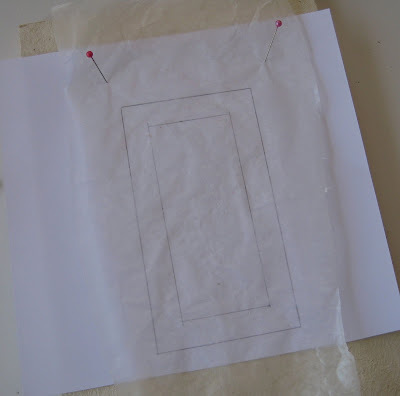 Draw the size of your window on a sheet of paper and place it on the softboard. Cover this with a piece of waxed paper. With a needle and thread run a gathering stitch through the top of each curtain. Pin the curtains on the window you have drawn. Pins with heads are much easier on the fingers! 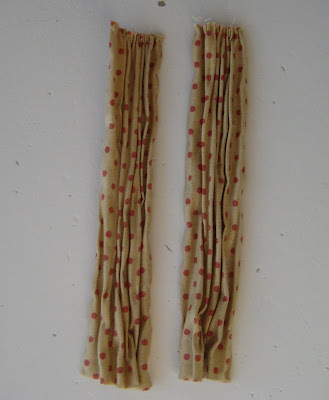 Pull the fabric from the bottom to make pleats and pin it. 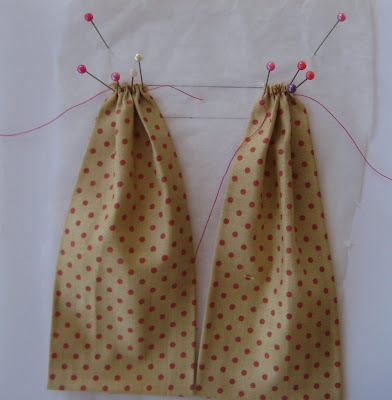 Stick pins in wherever you need to, to get the fabric to stay exactly where you want it. 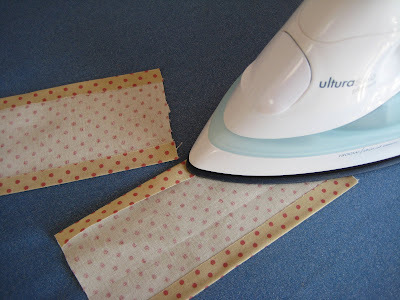 I've done this in a bit of a rush, when you do it you'll make sure the fabric falls perfectly! Now here's the secret weapon - a can of strong hold hairspray. Yes, that's right HAIRSPRAY. Whatever's cheapest at the supermarket will do! 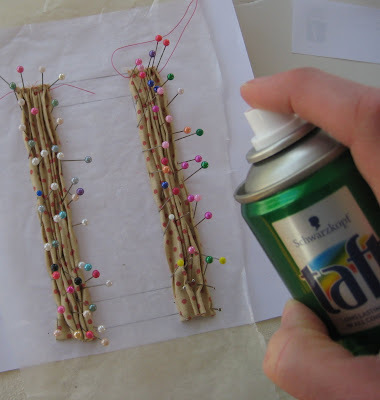 Spray the pinned fabric until it is quite wet. 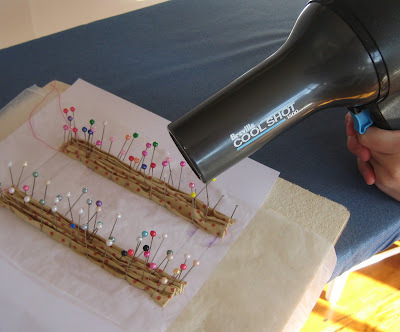 Next, because we want results fast, use a hairdryer to dry the fabric. It'll only take a minute or two. 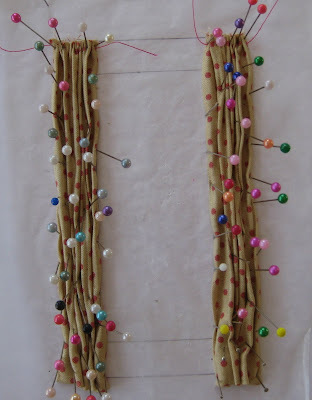 When the fabric is dry you can take all the pins out. Your curtains will be quite stiff and stay just as you have pinned them. 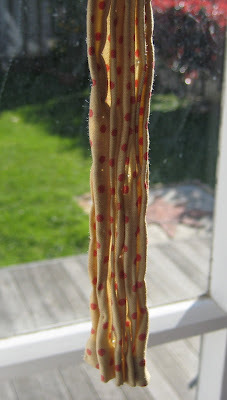 And here is a pic of my rather hastily made curtains hanging in the new lounge. Not completely sure I like that fabric but it will do for a week or two. So now you know, hairspray is how I got the dresses to drape like that. And how I got the curtain in the wardrobe door to stay like that. I have to say I have always been particularly pleased with the way that wardrobe curtain turned out! 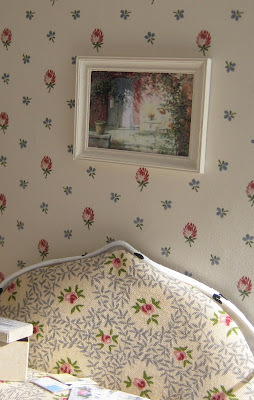 It works really well for bedding too as you can see at Linda's blog. According to the lady who showed me how to do this, these things will stay like this for years! So take your time and have fun! 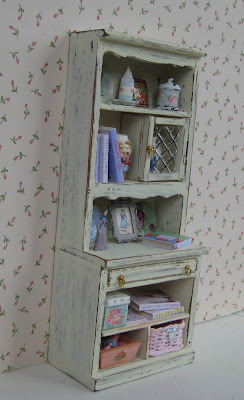 Shabby chic surprises from Sabiha! Yesterday there was a wonderful surprise from Sabiha in my mailbox. 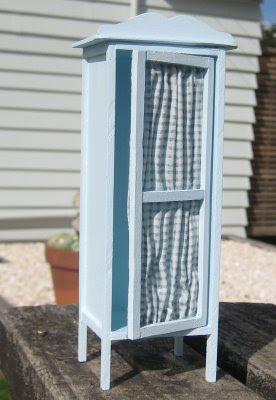 Minis for the shabby house!! Two boxes of the teensiest chocolates and those little tiny gold shoes. 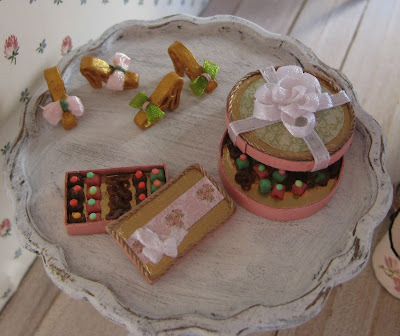 Sabiha is amazing when it comes to making the tiniest things, those beautifull boxed chocolates are miniscule! 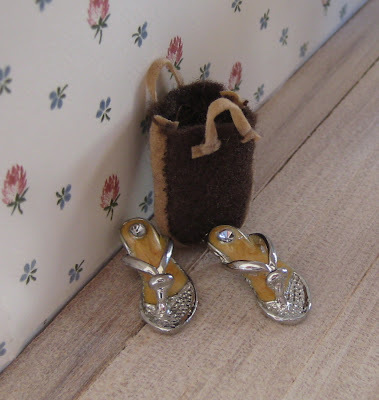 This little bag had these gorgeous silver sandals in it. 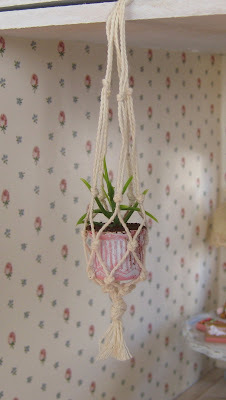 A little macrame pot holder. 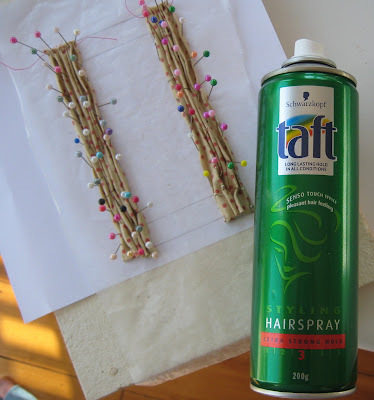 The last time I did macrame I was about 11 years old and I actually made one of these for my dollhouse way back then but it disappeared many years ago. And these beautiful little frames. Everything is just perfect!! Thank you Sabiha for the shabby surprises! 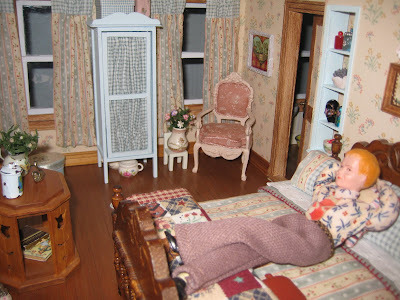 And thank you to everyone for your compliments on the country couch! I think there might just be a little bit of country in all of us!